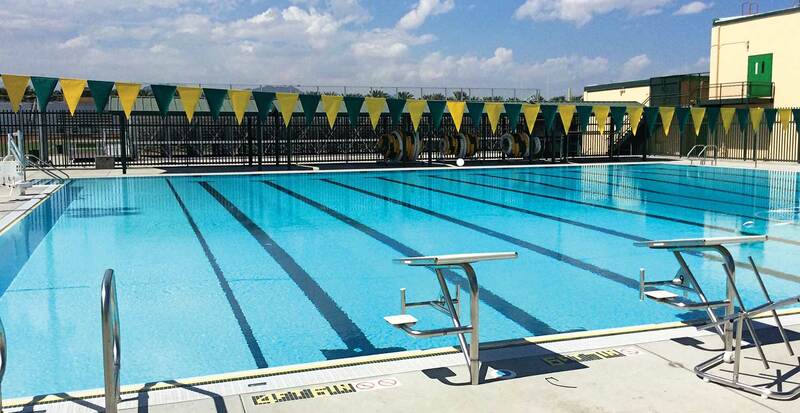 This new 25-meter x 25-yard pool is designed for com­pet­i­tive swim­ming and water polo as well as P.E. Steps at the shal­low end allow easy access for kids learn­ing to swim. Arch Pac designed the new bath­house in the Art Deco style of the school’s 1930s-era archi­tec­ture. The project also includes new bleach­ers, shade struc­tures, and expand­ed vol­ley­ball courts.